Lai-Sheng Wang places a tinker-toyish thing onto a visitor's palm. Many such toys line the Washington State University physics professor's Pacific Northwest National Laboratory office in Richland. The object at hand—12 steel balls hinged to red plastic tubes twisted this way and that—form a perfectly symmetrical, 20-sided icosahedron. Wang also displays a daughter-fashioned Father's Day card that testifies to his paternal greatness. He spends time with the family, washes dishes, cooks, and is always kind. Mixed in there is a gilded item that truly separates Wang from all other pops on earth: he fathered the gold buckyball. The word "buckyball" derives from "Buckminsterfullerene," a hollow cluster of 60 carbon atoms discovered by Richard Smalley at Rice University. Wang worked with Smalley until joining WSU in 1993. He is also an affiliate senior scientist at the Department of Energy laboratory. The "hollow gold cage," as Wang calls it, is the official reason for today's visit, but Wang is full of surprises. The cluster's practical use is unknown, though gold is valued as catalyst and component of advanced electronics. 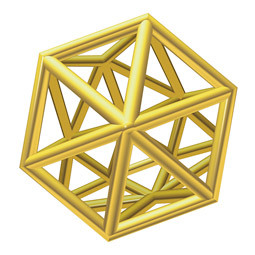 What truly excites people is the gold's status as the first buckyball-like structure made of metal. Because of their tendency to clump, metals have presented a special challenge to architects of the very small. One group in Europe theorized that 32 atoms was the hollow-cage gold analog to carbon 60. But Wang's team elicited what is called the photoelectron spectra—a physical signature—of the gold 32 cluster and found it just another compact clump. Wang's group already knew that at 20 atoms gold assumed a 3-D pyramid shape and that clusters of 15 atoms or fewer remained flat. So they concentrated on the clusters between 16 and 20 and, buttressed by theoretical calculations that tease out specific geometry, found that all but one possible configuration of 16, 17, and 18 atoms were open in the middle. After they published this finding last May in Proceedings of the National Academy of Sciences, the news escaped the arcane world of materials science to engage a larger cultural conversation. The New York Times carried a story that prompted a Princeton mathematician, a New York playwright, students, and other readers from all over to bombard Wang with helpful suggestions for an original name. Wang thanked them but resisted. Why? Wang explains that the gold is lovely but unstable; it can maintain its shape only while free-floating in a vacuum or pressurized gas. It is the metal-cluster equivalent to a sickly but adorable puppy in a pet store window that you have no intention of buying. Back to the toy with 12 atom-balls. Shouldn't it have 16 to 18 atoms? No. Wang announces, "It is tin!" A second hollow metal cluster! Wang quietly slipped the tin findings into a chemistry journal a month after the gold study. This cluster he actually named "Stannaspherene," after the Latin word for "tin." After what happened with gold, he says, he'd have felt uncomfortable making a big deal out of this one. Still, he can barely contain his excitement. Tin's perfect mini-buckylike symmetry suggests it is more robust than gold at holding its shape. And like the gold cluster, tin is more than 6 angstroms across (roughly a ten-millionth the size of a comma), large enough to contain other metal atoms. Such configurations, according to Wang, can act as "chemical building blocks for cluster-assembled nanomaterials." Time to cross the hall between Wang's office and his lab in the sprawling W.R. Wiley Environmental Molecular Sciences Laboratory. Off to one end is a large, U-shaped apparatus that performs the photoelectron spectroscopy. Photoelectrons carry all of the structural information, a physical-chemical fingerprint, about the clusters from which they came. On one side of the U is a laser that vaporizes atoms from a metal sample affixed to a tiny drum inserted into the machine. This creates a hot plume, tens of thousands of degrees, of distinct atoms that are cooled by a high-pressure helium gas. The material condenses into clusters of a few atoms to a few hundred atoms, swept along by the helium and sorted according to how fast they make it across the bottom of the U to the far side. There the clusters, each with a known number of atoms, are pulsed with another laser to shake loose their atoms' photoelectrons. The other fork of the U is the end of the line, a 12-foot tube Wang calls "a race track" that the photoelectrons must traverse to reach a detector that will yield the spectra for calculating their structure. First, though, the quarry must be coaxed along by a strong magnetic field, or "magnetic bottle," that keeps all these photoelectrons that have been flying off the clusters in all directions on the race track and moving toward the detector. Of the handful of U.S. groups performing photoelectron spectroscopy, Wang says, "we have the best magnetic bottle, which allows us to detect 99 percent of the electrons. Since there are so few, we don't have the luxury of throwing any away." Wang frequently refers to what he does as "alchemy," an "intellectual curiosity." "If you want to make it big," he says, "you have to make material, come up with a sample"—something you can see in bulk, rather than isolated clusters. "Look at the Buckyball. It's very stable in air. Any idiot can make it—even a physicist." A nickname might help, too. Stannaspherene? Hard sell. How about Haleyball, for Jack Haley, the actor who played the hollow Tin Man in The Wizard of Oz? The alchemist will take it under advisement, maybe save the nickname for when he puts another atom inside the cluster and gives the Tin Man a heart.